The Verge Gardeners Strike Again! On Saturday we met on Ushii’s verge in South Guildford. A few weeks ago our group had removed her roses and since then Ushii and her two visitors from France, young Fabien and Aurelie, had moved a limestone border to provide an edge between the verge and the front garden. Now the verge was ready for mulching. 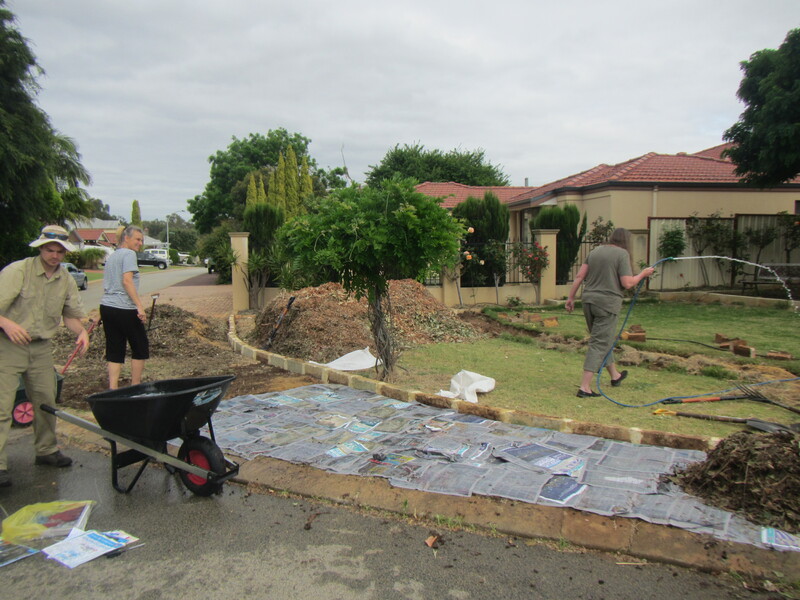 With an endless supply of newspaper (thanks Cristina) and a free supply of mulch (thanks Mulchnet) we got started. 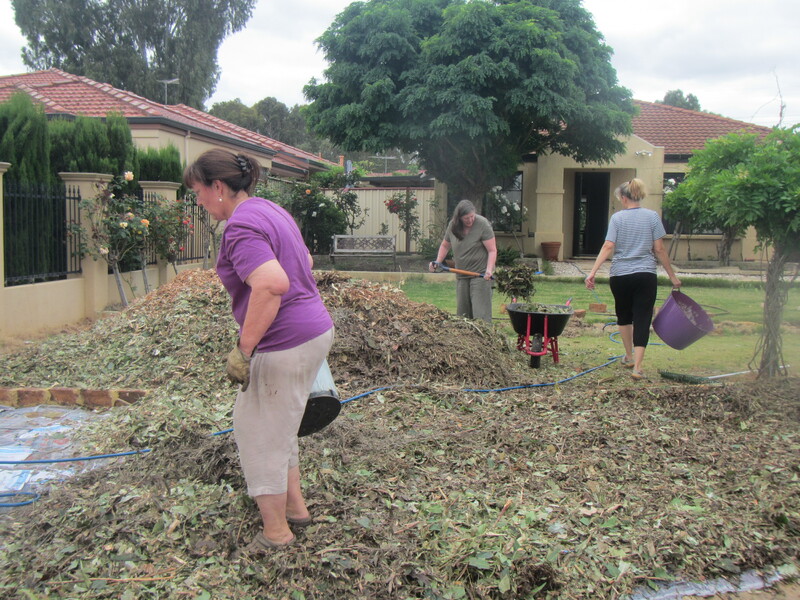 Firstly we covered the couch grass with a layer of manure and then we piled on thick layers of wet newspaper. The manure stimulates growth of the couch grass and weeds briefly, only for them to die under the complete block out of sunlight by thick, well-layered and well over-lapped newsprint, cardboard or used carpet. This is a very effective and non-toxic method of weed suppression under the mulch layer. 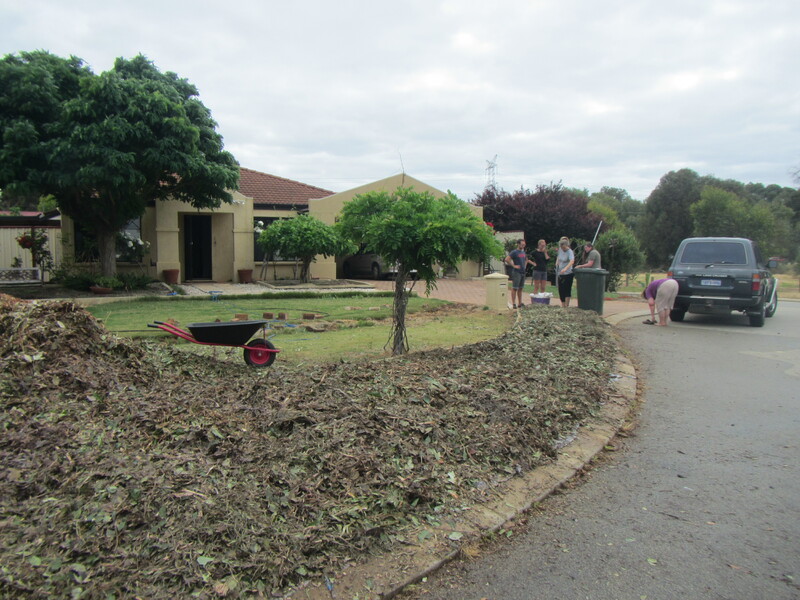 With seven of us helping out together, and Peter’s massive fork, the mulch moved quickly; the whole process only took one and a half hours. Then it was time to down tools and adjourn to Bolt Coffee at Men of the Trees for a great cuppa. 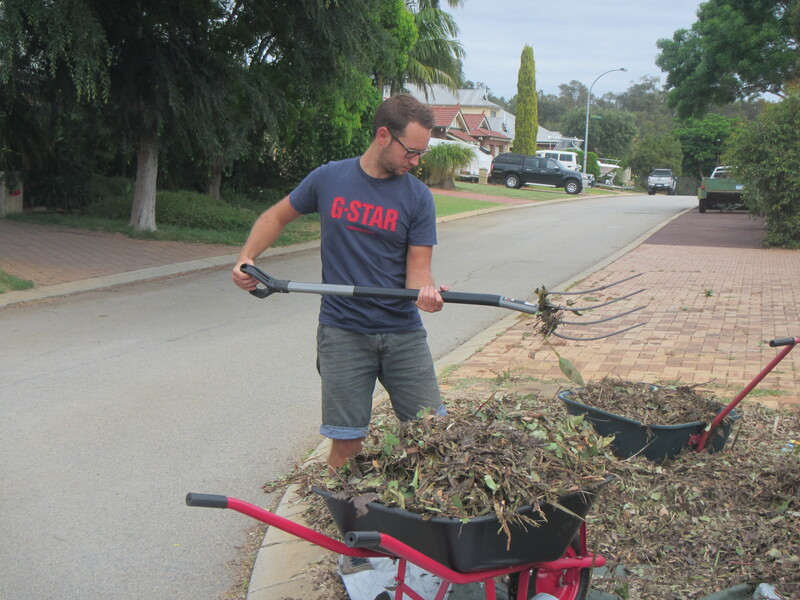 There’s nothing better than getting a job like this done quickly with a few helping hands. as was Aurelie, though I think they were a little bewildered by the whole process! Whereas the regulars have seen it all before….. This is a great time of year to prepare a verge, as there are months for the mulch to break down and start enriching the soil. Any grass that comes through can be covered and the verge should be ready for autumn planting. 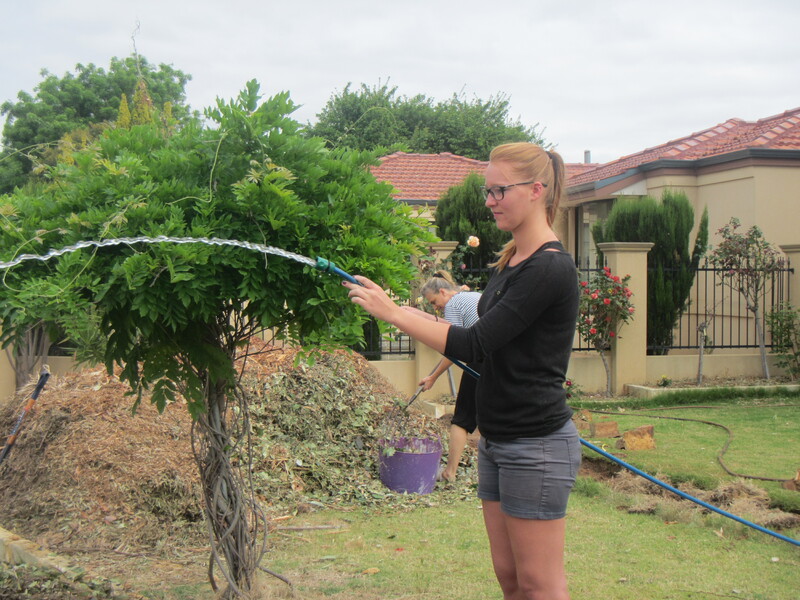 In September Lisa Passmore from Inspired By Nature gave us a talk on growing natives. She brought along various plants which are suitable for verges and gave us tips for growing in our local conditions. We plan to follow up with a workshop on propagating native plants. 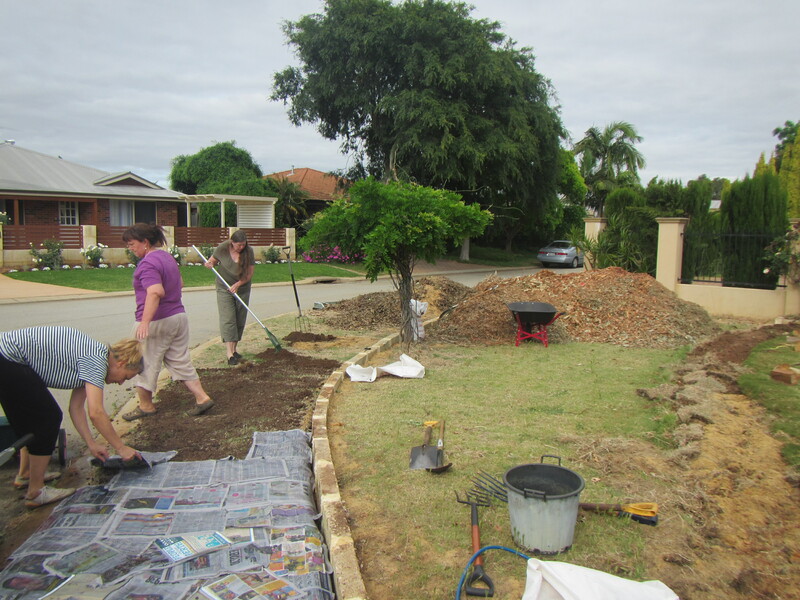 Not all the verges we work on are natives; several in our group are growing veges and fruit trees. Our next busy bee is Sunday November 1st, more mulching, with of course plenty of socialising and always ending with a cuppa! If you would like to join us, then please contact Pam at pamela.riordan@gmail.com. 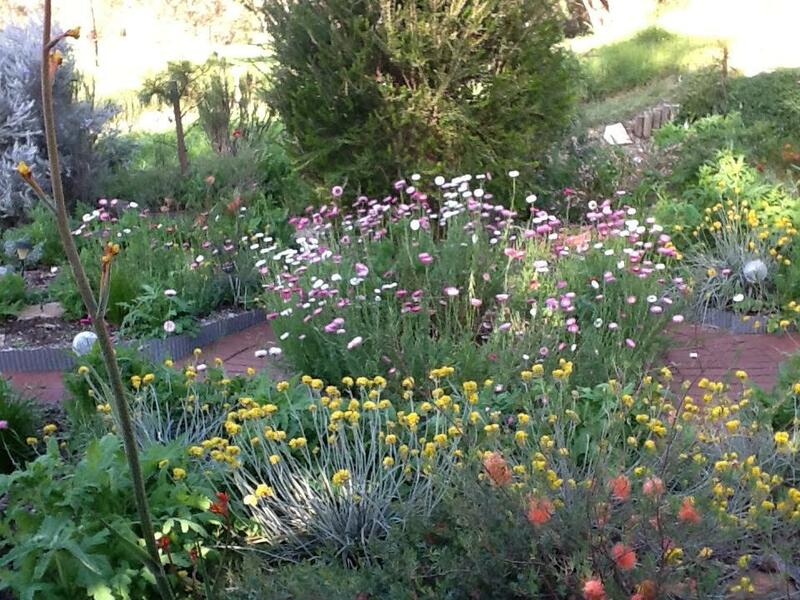 This entry was posted in Verge Gardening and tagged DIY gardening, natives, Veggies. Bookmark the permalink.